FILE - WhatsApp and Facebook messenger are among app icons seen on an iPhone. FBI Director Christopher Wray speaks at the International Association of Chiefs of Police annual conference, in Philadelphia, Pennsylvania, Oct. 22, 2017. 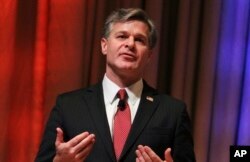 “I get it, there's a balance that needs to be struck between encryption and the importance of giving us the tools we need to keep the public safe,” Wray said. Wray also decried a potential “blind spot” for intelligence gathering if Congress doesn't reauthorize an intelligence surveillance law set to expire at the end of the year. The Foreign Intelligence Surveillance Act allows the government to collect information about militants, people suspected of cyber crimes or proliferation of weapons of mass destruction, and other foreign targets outside the United States. Intelligence and law enforcement officials say the act is vital to national security. “If it doesn't get renewed or reauthorized, essentially in the form that it already is, we're about to get another blind spot,” Wray said.